"Three cheeses layered with pasta and marinara sauce. This recipe is so easy and so good!" Bring a large pot of lightly salted water to a boil. Add ziti and cook for 8 to 10 minutes or until al dente; drain and rinse. 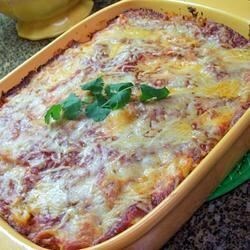 In a medium bowl, mix ziti, ricotta cheese, mozzarella cheese, egg and 1 1/2 cups spaghetti sauce. Lightly grease a 9x13 inch baking dish and spoon in ziti mixture. Top with remaining spaghetti sauce, followed by Parmesan cheese.